We have looked at several NVIDIA RTX 2000 Turing series cards already. This includes several blower type cards like the ASUS Turbo RTX2060-6G Blower, ZOTAC RTX2070-8G Blower, ASUS Turbo RTX2080-8G Blower, and even an NVIDIA GeForce RTX 2080 Ti. At STH, we focus on computer-related performance rather than gaming performance. 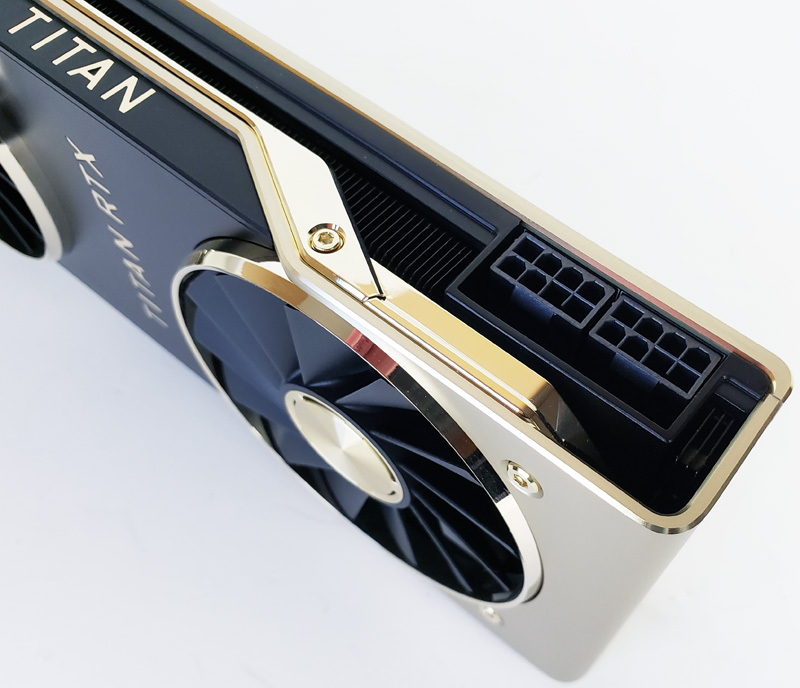 The NVIDIA Titan RTX that we review today can play games but with a $2,499 price tag and 24GB of memory, it is clearly focused on the professional computing market. 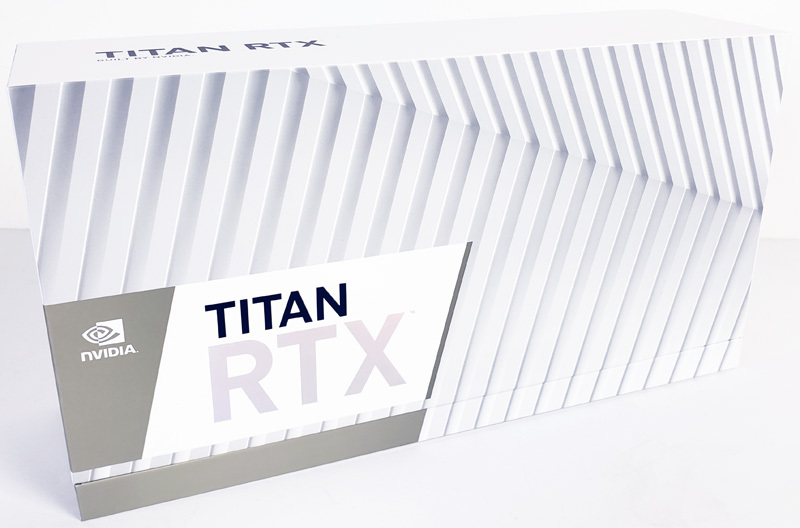 The Titan RTX is the highest performing desktop graphics card we have tested to date; it is geared for workstation use with rendering and deep learning in mind. We are going to get to our benchmarks soon, but it is rated to be three and four times faster at deep learning workloads like ResNet-50 and GNMT, which makes this GPU attractive for researchers and data scientists. For that market and for $2500, it may indeed be a relative bargain. 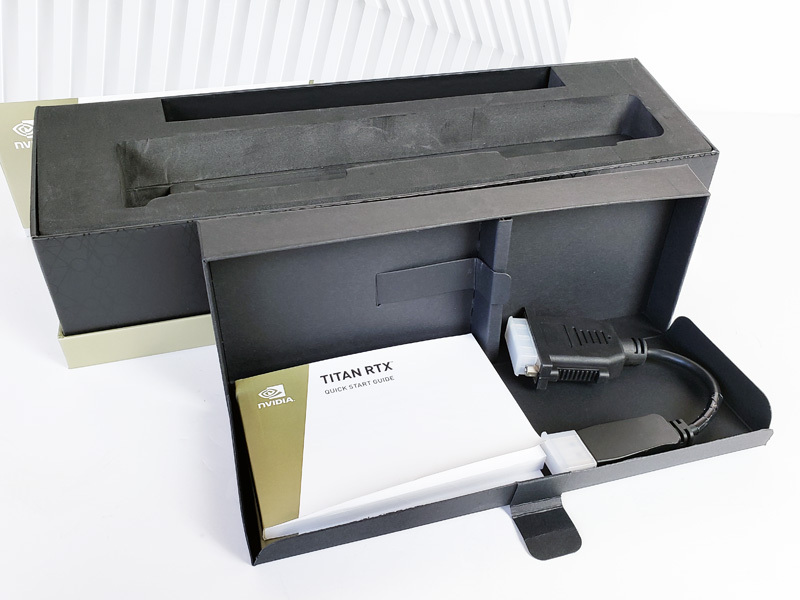 Here we see the retail box for the NVIDIA Titan RTX; specifications are listed at the bottom of the box. Here we have removed the top of the box revealing the Titan RTX inside. 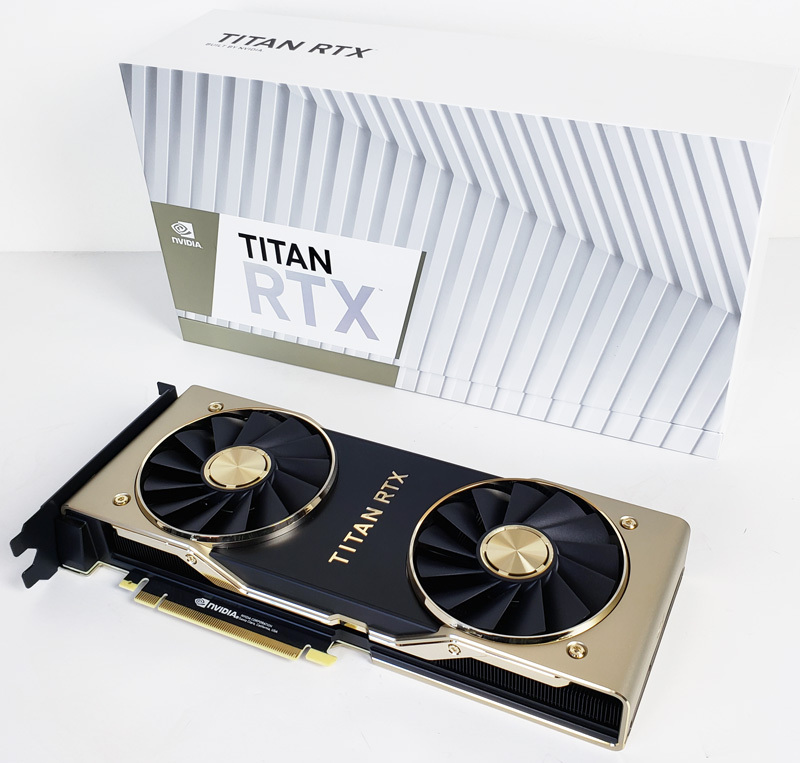 Just behind the Titan RTX is an accessory box. Included with the Titan RTX are quick start guides and a DisplayPort to DVI-D dongle. No other items come with this kit; current drivers are available from NVIDIA. Frankly, this is all you need. With the NVIDIA Titan RTX out of the box, we get our first look at the card. 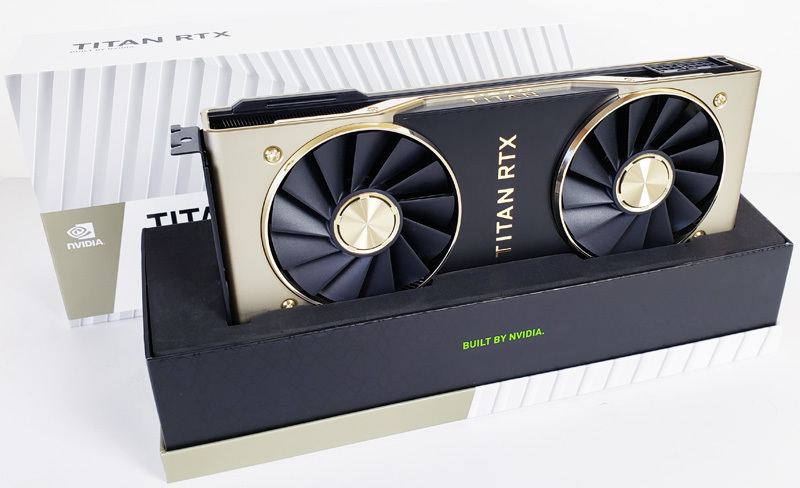 The Titan RTX looks very much like the NVIDIA RTX 2080 Ti we reviewed earlier with the difference being gold in color vs. silver on the RTX 2080 Ti. NVIDIA has used gold in this segment before. It is a quick visual indicator of differentiation. 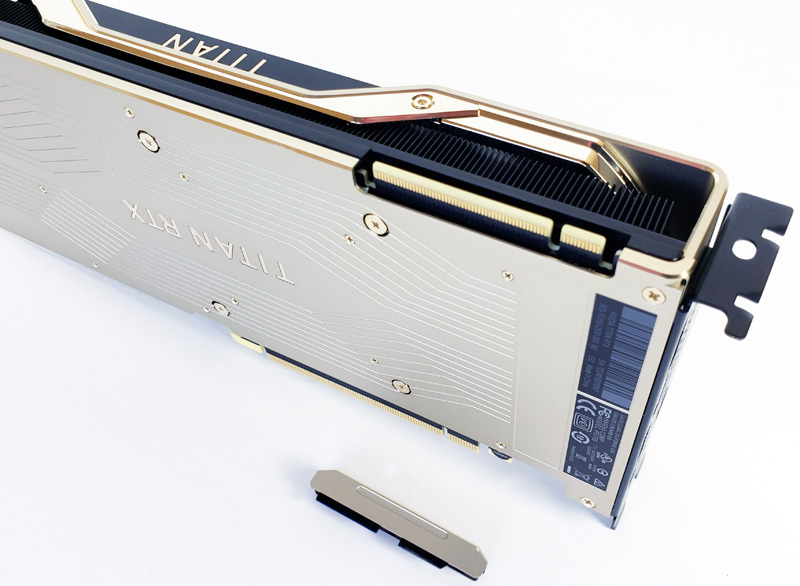 Gold also is a metal with cultural significance, beyond its commercial value, in many cultures where NVIDIA hopes to sell the Titan RTX. Like the GeForce RTX 2080 Ti, NVIDIA uses a full-card vapor chamber to maximize heat transfer to cooling fins under the fans. At the back of the card, we see a full-size back-plate that aids in cooling and helps protect and support the PCB underneath. We have written about the differences in cooling types found on NVIDIA GPUs before, dual fans vs. blower-style coolers. This is a significant departure from the previous generation NVIDIA GeForce GTX 1080 Ti Founders Edition and Titan V cards that utilized blower style coolers. At STH we had many of the GTX 1080 Ti’s installed in machines like DeepLearning10 and DeepLearning11. Blower-style coolers exhaust heat outside of the chassis while the new dual fan design recirculates heat inside the enclosure. 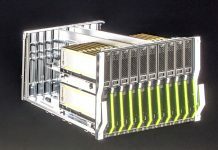 Practically that limits the number of cards you can put in a system and increases the chassis fan cooling requirements. A benefit of this style of cooler is that if you have one or two in a system it can be substantially quieter than the blower style cooler under load. It is a tradeoff, that sacrifices the ability to run the Titan RTX in dense configurations for better cooling in smaller configurations. At the back top of the card, we find 2x 8-Pin power connectors. Given that this is a top-end GPU, it requires over 280W of power delivery. Video outs are 3x DisplayPort 1.4 ports, 1x HDMI, 1x USB Type-C.
At the top-front of the card, we find an NVLINK-Bridge which has a snap on cover for protection if used in single card setups. The NVLINK PCB is something we would recommend to users with two cards. It is also expensive at $80 for a small PCB we wish NVIDIA simply had a program that you got one via FedEx if you registered two cards. In person, the card is stunning. It certainly looks like a more premium part than the GeForce RTX 2080 Ti. Next, let us take a look at the NVIDIA Titan RTX key specifications and continue on with our performance testing. Radeon VII is a great card for programs like Davinci Resolve (on par with the RTX Titan X). NVidia’s drivers are oftened better optimized for benchmarking programs. When you really want to know the performance of a graphics card go to pugetsystems, they test with real programs and are open for comments and also react on the comments. 1) We do not have one. 2) On the DemoEval side, we have yet to get a request for one but we have had many requests for the Titan RTX. Unfortunately, the economics, for us, of buying a $2500 GPU to put in the lab are actually better than getting a $700 Radeon VII. If someone has $700 lying around and wants an answer, we are happy to do the work. We just need to fund it. Absolutely Just Stunning Titan RTX Mr. Harmon Read your Report. Gold is Best your correct on that. Remarkable ! The magnitudes of scale are 5x over the last K2500. 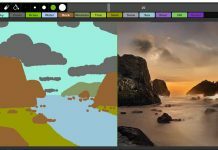 This represents ability to complete computation and rendering on a matter of seconds vs minutes -hours for older systems. Mr Cray would be besides himself with envy and desire to have one. Any institution of higher learning will either aquire this or be left behind in the dustbin. 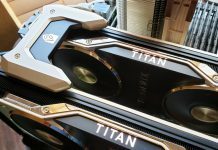 Titan Indeed..Great Review! Please use same driver version for all cards. There can be over 10% delta in cuda between drivers in some cuda programs, while other programs see 0% delta.